Did you know that only 57.6% of businesses use Social Media? What is even more surprising is that 30% of consumers want to support brands online but cannot do so, if a business is not embracing social media. When I work with business owners and CEOs I notice that there is a huge disconnect. The disconnect is based around connecting with customers online. Staff are often not aligned with the value proposition of a business. 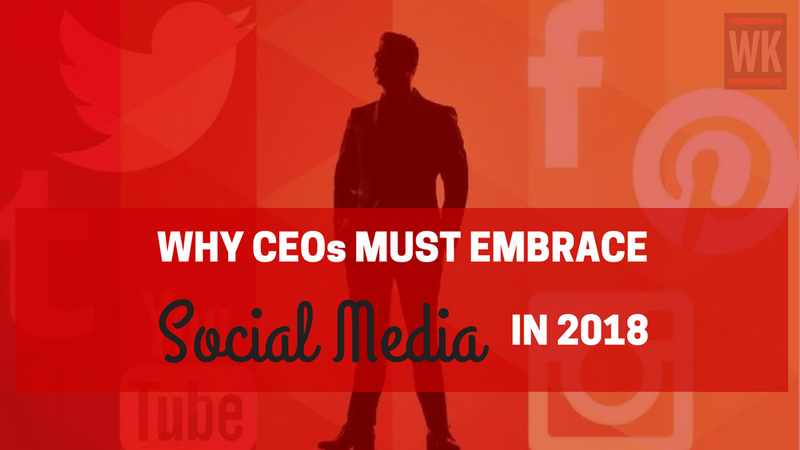 As a CEO and owner of a couple of businesses myself, I want to help fellow business owners understand the importance of social media and why you must embrace social media and content marketing in 2018. I receive emails on a regular basis from businesses talking about their latest articles, infographics and pieces of content. I always read these emails, and this is what inspired me to write this piece of content. Company formation experts, Turnerlittle.com published a press release on data they examined around social media usage amongst British businesses. They found that only 42% of businesses had a blog last year, and only 49.5% of businesses link to their social media pages on their website. If your audience are wanting to support you, and engage with you online, why are you, as the CEO or business owner not embracing social media? The first time I really found myself researching social media was because of a captivating interest in the online world. Whilst my interest first grew from desperation, it became something completely different, and I am now a thought leader in that world. Yes, I am a thought leader in my industry and yes, social media helped me achieve this, but there is much more to it. When I read the study by Turnerlittle.com, I was shocked to read that only 42% of businesses actually have a blog. Blogging has been one of the most amazing ways for me to build my presence online, and give me a conversation-starter, or my point of view on something important. If you are the CEO of a business, part of embracing social media is understanding that you not only need to share content written by thought leaders, but also write your own content. If this is something that you do not have the time for, or struggle with, hire someone who has a background in writing content to do it for you. I have members of my audience who have been following everything I do for around 2- 3 years, and only NOW are they ready to spend their money with me. And that’s OK, because I know that trust has been built through being a thought leader, and they will become repeat customers. According to the study, 34% of consumers said they may not do business with a brand that had no social media presence. Building your brand starts with you (the business owner). Your consumer needs a reason to buy your product or service and that begins with a human connection. Consumers know what they want, and your brand must reflect this. Having a social media presence builds trust, authority and legitimacy, especially if social media users feel it is important to support their favourite brands online. If this is key to you, you need to make sure that your branding reflects who you are as a business. Finding your brand identity does not happen overnight and can be a long, challenging process. You do need to look to the future. Think three years ahead. Will your branding still be relevant to your consumers? As your business goals change, so might your branding; and be aware that consumers are not fond of change, so bear in mind that strong branding will still sell your business in years to come. Between the second and third quarters of 2017, social media users grew by 121 million. That’s 3.5 billion internet users, and 3.03 billion active social media users. Finding your customers’ pain, and solving it, is what leads to a successful business. Don’t just give your audience what THEY want; think ahead. How can you solve their current pain, then pre-empt the next pain and already have it solved? This, in part, can be done through the strategic use of social media. To actually understand where your audience loves to hang out, you need to look at the demographics for each social network, and marry this up with your ideal target customer. I have written a great article on Social Media Demographics, which share the latest stats around each social network. You can read this article here. Almost 25% of businesses said that they use social media and content writing to develop their business and market their products. Social media is no longer just a native way of engaging with consumers. Advertising on social media should now be a huge part of your marketing strategy, and I have personally seen great results because of this. For every webinar I run, and every course/product I release; I will always market this through Facebook, Instagram and Twitter advertising platforms. 13% of social media users have said they click on advertisements on a regular basis. If one of the biggest outcomes you want to achieve when using social media is to find new customers, build brand exposure through running advertising campaigns. As a CEO or business owner, you may find that your business is growing which is great, but how are you dealing with the never-ending list of actions that need to be taken? Use Social Media (and more specifically, LinkedIn) to find people to hire. Social media has proved time and time again the power of finding great professionals who are looking for a wide variety of job roles. Use this to your advantage, and when looking at hiring a new team member, go to LinkedIn. Did you know that 92% of consumers have made a purchase after reading about a product on their favourite blog? A further 65% are likely to make a purchase if someone they follow on Social Media recommends a product. The idea is to have people who are influential online spreading the message about your business for you. This type of marketing can be in the form of blogger reviews, Social Media posts, endorsements and various other forms of content. We have seen how influential this can be, especially on YouTube. Influencers on YouTube are often sent new product releases and in exchange, they talk about it to their audience. In some cases, influencers use ‘sponsored’ content, which means that they are being paid to talk about a product/service. Did you know that 77% of Twitter users feel more positive about a brand when they have had an interaction with them on social media? 82% of consumers have ended their relationship with a company due to poor customer service. The big question is: What are you doing to retain customers? Listen to your customers. Engage in a two-way conversation with them. They are using social media, and WANT to spend their money, but only when they feel listened to. In the era of the ‘experience,’ you have to give your customers an experience they’ll fall in love with. For example, Uber and Airbnb have grown to be successful companies because they provide a great customer experience while fulfilling a need. Put yourself in your target customer’s shoes. What is their first thought when researching a product? How do they progress from there? What kind of customer service support, and engagement are the looking for from you? Audience members who take part in my online courses always ask questions about the world of technology being so overwhelming because of the abundance of tools available. Whilst I use a large selection of tools, I know that the world is constantly changing. I realise that as a business owner and a thought leader, I am looked to for advice. I can only give this advice, if I am as up-to-date on technology and trends as possible. This became very clear to me when I wrote the second edition of my book; Think #Digital First. Close to 40% of the tools that I’ve used over the years are no longer available. However, it’s not about the tool/company you use, it’s about the outcome you achieve through using technology. Stay as up-to-date as possible with technology, so that you’re always one step ahead of your competitors. Before I close this article out, I just want to talk about something that has been a huge part of my digital journey especially in the last 12 months. Embracing emerging technology. Moving forward, you are going to be looking at different ways of dedicating your resources. We have seen the rise of Artificial Intelligence, Virtual Reality and Blockchain over the last 12 months. In my opinion, 20% of your resources should be dedicated to emerging technology. But… do not get sidetracked. The “must-haves” of video, marketing automation, remarketing, and storytelling through SEO are still as important (if not more so) as they were in 2017. What one change are you going to make NOW, that will help you embrace social media in 2018?